Photographs can never convey the breathtaking beauty that is Aitutaki. Warm, crystal clear waters fill a triangular shaped, turquoise blue lagoon....so blue you'd think someone had painted it that colour! Each leg of the triangle stretches more than 11 kms (7 miles). Dotted around it are uninhabited, palm filled islands or "motus", with sparkling white sand...reminiscent of the sort of a picture a child would paint of a desert island. Aitutaki is the second most visited of the Cook Islands, and particularly popular with honeymooners. Tourism facilities are well developed, but the total number of visitors a year remains a small fraction of those staying on the capital island, so Aitutaki still feels very unspoiled. Aitutaki and its stunning blue lagoon as seen from the space shuttle. Captain William Bligh was the first European to discover Aitutaki, on 11 April, 1789...17 days before the infamous mutiny on his ship, the Bounty. And he was no stranger to the Cook Islands as he was previously Sailing Master on HMS Resolution during Captain Cook's third voyage. Historic documents say that when Bligh weighed anchor off Aitutaki, a native came out in a canoe, rubbed noses with him and gave him a pearl-shell breast ornament suspended from braided human hair. Bligh visited again on 25 July, 1792. Read about the discovery of what Bligh called a "charming little spot"
Aitutaki's lagoon is teeming with fish and to swim among them is like taking a dip in a tropical fish tank. The very lucky visitor might even catch a rare glimpse (as I did) of a turtle skimming through the waters. 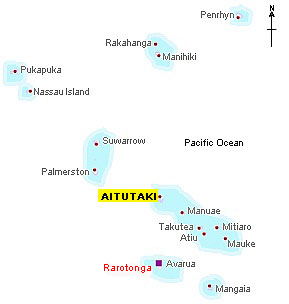 No surprise then that Aitutaki is listed in a number of books as one of the places everyone should see before they die. The Pacific Resort Aitutaki has won many top honours at the World Travel Awards which are the 'Oscars' of the travel industry. And for two consecutive years it was voted the best island resort hotel in the world. The beauty of the hotel is beaten only by the beauty of the lagoon it overlooks. Tapuaetai is supposedly known to all as One Foot Island because, from the air, it resembles a left foot. A tribe once attacked the main island and a man and his son escaped by canoe to an unnamed islet. The father carried the boy across the beach and hid him in a tall coconut tree. Then he paddled all the way to Rarotonga for help. When the attackers reached the islet they saw only one set of footprints on and off the island and they left. The boy remained safely hidden until his father returned with help. And from then on, the islet was known as One Foot Island. Aitutaki is easy to get to. Air Rarotonga operates several flights a day from the capital island and some international services link up with the domestic flight so you could by pass Raro altogether (but that would be a shame). Flying time is about 45 minutes. You can even do a day trip, which includes a fabulous lagoon cruise. Its very pricey at nearly NZ$500....but I defy you not to say it was well worth the money when you retun from the trip. Cars and scooters can both be rented; a scooter is typically NZ$25-30 a day plus petrol which is very pricey compared to the US but similar to UK costs. And you'll need to buy a local driver's license from the police station. There are some taxis too, but these are very expensive.